Asking teachers to consider incorporating ‘civic education’ into their practice can sound quite stressful, particularly when they are already overwhelmed with trying to impart to students the required knowledge and skills in their subject areas. Civic learning can very easily be viewed as one more thing piled on top of the countless other valuable goals that teachers would love to pursue, but reluctantly sacrifice in order to cover as much as possible before the looming standardized assessments arrive. After all, isn’t civic education just the responsibility of social studies teachers, anyway? In order to reduce the stress, we simply need to re-imagine what civic education means and what it looks like in action. It need not be a separate body of knowledge and skills to be piled atop what teachers already do (are you imagining diagrams of the three branches of government, or how a bill becomes a law?). Instead, it can be thought of as an overarching purpose to what we do as teachers that pulses beneath every lesson and emerges in the kinds of products we ask students to create with their knowledge and skills. In the end, all of the teachers I know do what they do because they want to send young people out into the world who are prepared to succeed not only in college and in their chosen careers, but who will help sustain our democratic society for future generations. When we shift the paradigm of civic learning from being another subject area to teach to the purpose of what we already teach, we open up a wealth of opportunities to integrate civic learning into our classrooms. One opportunity that I take advantage of that I’d like to share involves utilizing the Common Core Literacy Standards to support the teaching of what I call ‘civic literacy skills.’ This is a particularly powerful opportunity because it is open to teachers from all subject areas now that we are all responsible for teaching literacy skills to our students. So what are civic literacy skills? Simple – they are the skills that come to mind when you consider this question: What literacy skills do you think your students need in order to be thoughtful, engaged citizens? 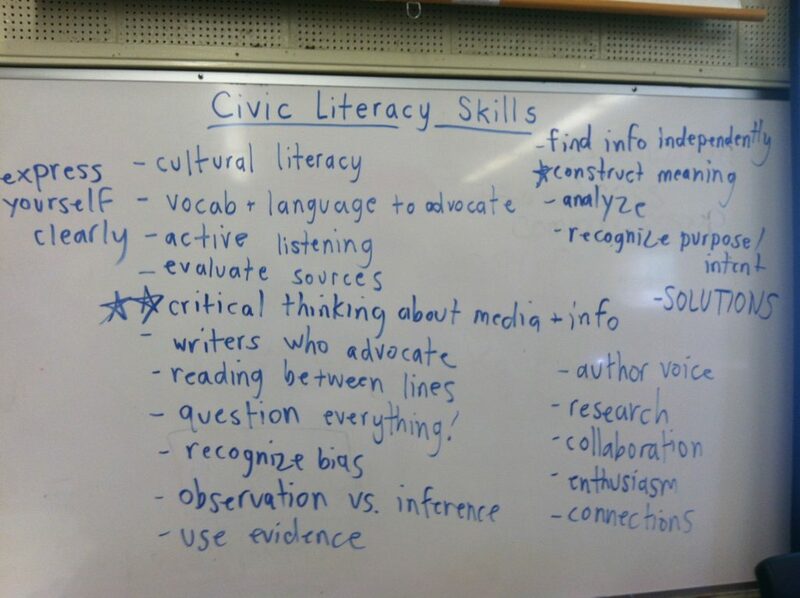 The images on this page display the lists of civic literacy skills that teachers came up with in several workshops that I facilitated last year. They range from asking critical questions to recognizing bias to developing informed opinions by harnessing evidence. 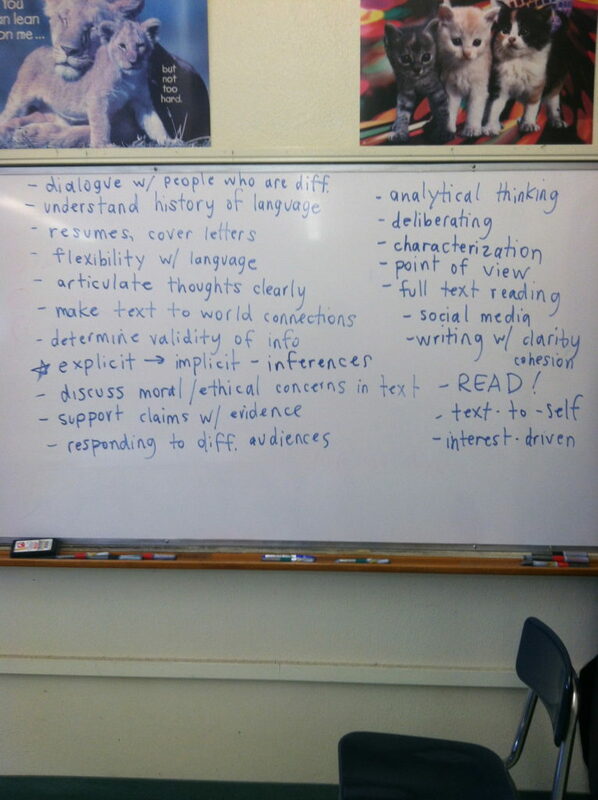 And the beautiful part is that these are literacy skills that we are expected to teach anyway through the Common Core. We do not need to do more as educators – simply recognize the potential for civic learning in literacy instruction and make it transparent for students in what we already do. Reading Anchor Standard #8: Delineate and evaluate the argument and specific claims in a text, including the validity of the reasoning as well as the relevance and sufficiency of the evidence. Writing Anchor Standard #6: Use technology, including the Internet, to produce and publish writing and to interact and collaborate with others. These standards, which apply to students from grades 6 through 12, provide standards-based justification for introducing informational and/or creative texts in any subject area that relate to real world controversies, encouraging students to analyze the strengths and weaknesses of these texts and formulate their own evidence-based opinions on these controversies, and helping them to publicize their opinions in authentic spaces to dialogue with others. In my mind, that is quality, standards-based civic literacy education. We just need to recognize the civic potential in the standards, draw it out, and make the process real and engaging for our students. Now I’d like to take you through my process in developing a year-long youth participatory action research project for my 11th grade ELA students that stressed both academic and critical literacies and focused on civic learning.